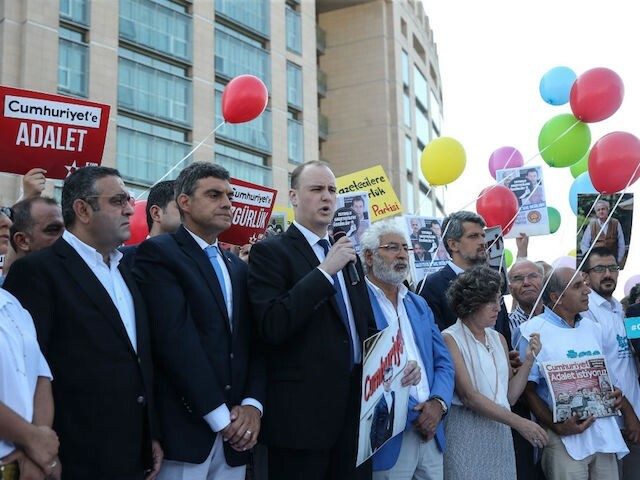 Seventeen editors and officers of Cumhuriyet, the oldest continually published newspaper in Turkey, appeared in court in Istanbul Monday to face a variety of charges including “helping an armed terrorist organization while not being a member of it” and “abusing trust” for their reporting. Supporters of freedom of the press and members of the opposition Republican Peoples’ Party (CHP) gathered before the Istanbul courthouse to support the journalists, the latest in multiple waves of legal action against the secularist-leaning newspaper by the Islamist government of President Recep Tayyip Erdogan. The Turkish newspaper Hurriyet—which itself has seen violent Islamist mobs attack its headquarters shouting “allahu akbar”—identifies some of those facing criminal charges as CEO Akın Atalay, IPI Board Member and columnist Kadri Gürsel, editor-in-chief Murat Sabuncu, and his predecessor Can Dündar. Dündar, who faced an assassination attempt at a previous trial for approving a report claiming Turkey had secretly provided weapons to Syrian rebels, fled to Germany and is being tried in absentia. 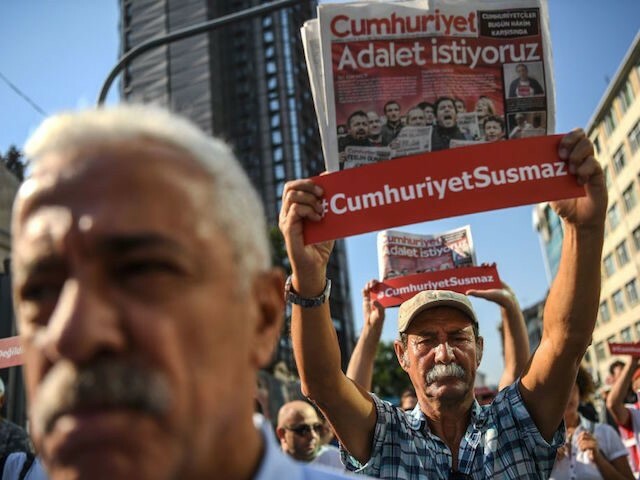 Prosecutors accuse Cumhuriyet staff of supporting both the U.S.-designated Marxist terror organization the Kurdistan Workers’ Party (PKK) and the Islamic movement founded by cleric Fethullah Gulen, which the government refers to as the Fethullah Terrorist Organization (FETO). 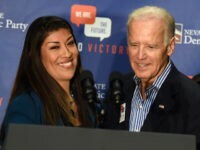 Prosecutors have not clarified how the journalists would ideologically reconcile supporting both an Islamic charter school network run from the United States and a Marxist atheist group the United States condemns. Gürsel reaffirmed his opposition to Gulen in statements to his own newspaper. 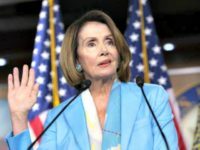 The seventeen face charges including both being a member of these groups and supporting the groups while not being a member, as well as the charge of “abusing trust.” They face between seven and 43 years in prison if sentenced. 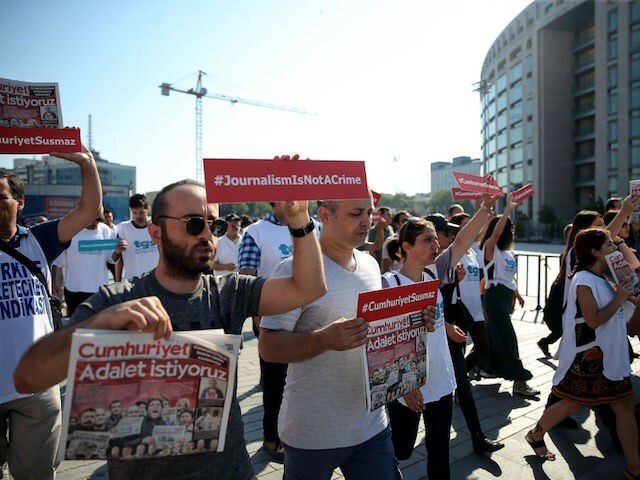 Holding signs reading “adalet” (“justice”) and “#journalismisnotacrime,” protesters marched to the courthouse and demanded the reporters and editors be freed. Notably, many of the women attended did not wear hijabs, which had long been unpopular in Turkey but become increasingly common under Erdogan. 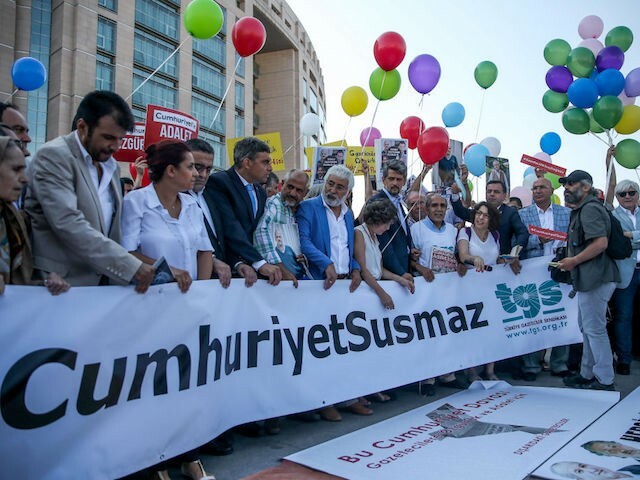 According to Cumhuriyet‘s coverage of the trial, representatives of Reporters without Borders, PEN International, the European Federation of Journalists, the International Federation of Journalists, the International Press Institute, the Socialist International, the CHP, and Kemalist organizations all joined in the protests before the Istanbul court. The CHP, the party founded by secularist Turkish founding father Mustafa Kemal Atatürk, recently organized a “justice march” against Erdogan that drew an estimated million people to congregate in Istanbul. “The [ruling Islamist Justice and Development Party] AKP mentality, which labels journalists as potential terrorists, actually causes terrorism on the free press,” CHP Deputy Chairman Veli Ağbaba told Cumhuriyet at Monday’s protests. 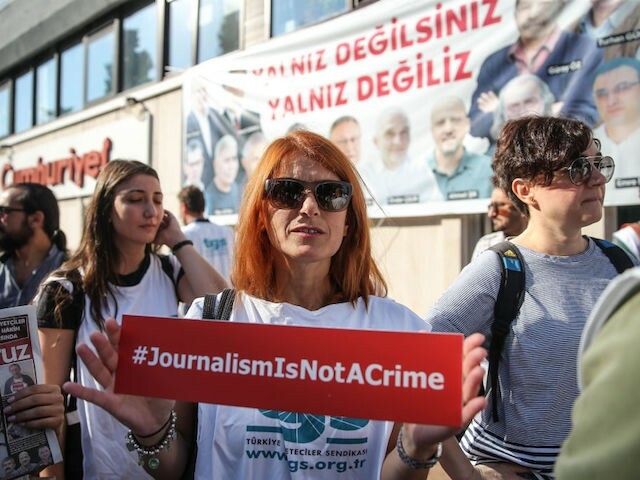 “One-third of the world’s [imprisoned] journalists are in Turkish prisons, unfortunately.” Another CHP official told the newspaper that 178 Turkish journalists have been arrested since the failed 2016 coup and 173 media outlets shut down. This trial is far from the first time Cumhuriyet has found itself in the crosshairs of AKP prosecutors. 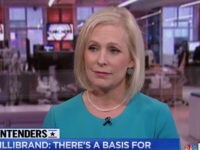 In 2015, the newspaper published a Turkish-language inset of the French satirical publication Charlie Hebdo in solidarity following an Islamic attack on their offices that killed multiple senior staffers; the move triggered a government raid on Cumhuriyet‘s presses and criminal charges. Last year, the government arrested a Cumhuriyet intern for attending a secularist, Kemalist rally and the Cumhuriyet cafeteria cook after the latter was overheard saying he would not serve Erdogan a cup of tea if he visited the newspaper; “insulting the president” is a crime in Turkey.